Magners Apple Premium Irish Cider is a popular Apple Cider available from DrinkSupermarket.com in 330ml to buy online. 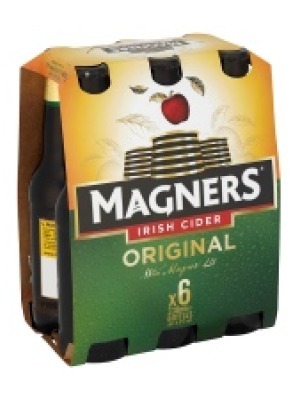 Visit DrinkSupermarket.com for the best price for 330ml of Magners Apple Premium Irish Cider or compare prices on our other Apple Cider products. Since launching over a decade ago Magners has spearheaded a growth in the Cider market. The classic drink hasn't changed a bit in that 10 years and Magners Irish Cider is still as popular as ever despite some close competition. Where to buy Magners Apple Premium Irish Cider ? Magners Apple Premium Irish Cider Supermarkets & Stockists. You can buy Magners Apple Premium Irish Cider online in most retailers and find it in the Apple Cider aisle in supermarkets but we found the best deals online for Magners Apple Premium Irish Cider in DrinkSupermarket.com, and others. Compare the current price of Magners Apple Premium Irish Cider in 330ml size in the table of offers below. Simply click on the button to order Magners Apple Premium Irish Cider online now.